Own The Lion King - Hakuna Matata Mug from Deff, DVD, Blu-Ray & 4K Video Specialists - Free UK Delivery.. The Lion King: Embark on an extraordinary coming-of-age adventure as Simba, a lion cub who cannot wait to be king, searches for his destiny in the great "Circle of Life." You will be thrilled by the breathtaking animation, unforgettable music and timeless story.The Lion King 2: Simba's Pride: Experience the power of "Upendi"- which means "love"- as Kiara, Simba's strong-willed daughter, seeks adventure away from her father's watchful.. Lion King: Experience the majesty of Disney's epic animated masterpiece as it roars onto Blu-ray and Blu-ray! With a spectacular picture, spine-tingling high definition sound and immersive bonus features - you will feel the love for this critically acclaimed and universally beloved classic. Embark on an extraordinary coming-of age adventure as Simba, a lion cub who cannot wait to be king, searches for his destiny in the great "Circle of.. Experience the power of "Upendi" - which means "love" - as Kiara, Simba's strong-willed daughter, seeks adventure away from her father's watchful gaze. Timon and Pumbaa can only do so much to protect her, especially when she encounters an intriguing rival, Kovu, a cub who is being groomed to lead Scar's pride. As Kiara and Kovu search for their proper places in the great "Circle of Life," they discover that it may be their destiny to re.. Hilarity reigns in the motion picture comedy-adventure that takes you waaay back to the beginning before Simba's tale began...and beyond! 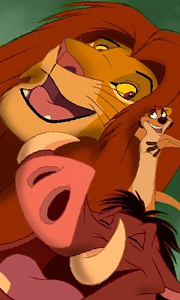 From their uniquely hysterical perspective, Timon and his windy pal Pumbaa - the greatest unsung heroes of the Savanna! - reveal where they came from, how they helped Simba save the Serengeti and what really happened behind the scenes of The Lion King's biggest events. This essential chapter of The Li.. The wait is over! Experience the majesty of Disney's epic animated masterpiece as it roars off the screen and into your living room on Blu-ray and Blu-ray 3D! With a spectacular digital picture, spine-tingling high definition sound and immersive bonus features, you will feel the love for this critically acclaimed and universally beloved classic! Embark on an extraordinary coming-of age adventure as Simba, a lion cub who cannot wait to b.. Experience the majesty of Disney's epic animated masterpiece as it roars onto Blu-ray and Blu-ray! With a spectacular picture, spine-tingling high definition sound and immersive bonus features - you will feel the love for this critically acclaimed and universally beloved classic. Embark on an extraordinary coming-of age adventure as Simba, a lion cub who cannot wait to be king, searches for his destiny in the great "Circle of Life." You..
Own The Lion King - Just Can't Wait to Be King Mug from Deff, DVD, Blu-Ray & 4K Video Specialists - Free UK Delivery..
Own Lion King 4K Ultra HD + Blu-Ray from Deff, DVD, Blu-Ray & 4K Video Specialists - Free UK Delivery..
Embark on an extraordinary coming-of-age adventure as Simba, a lion cub who cannot wait to be king, searches for his destiny in the great "Circle of Life." From the stunningly beautiful opening sequence over African vistas, to the hilarious escapades of "Hakuna Matata" with Timon and Pumbaa, to the awe-inspiring moment when Simba takes his rightful place atop Pride Rock, you will be thrilled by the breathtaking animation, unforgettable ..